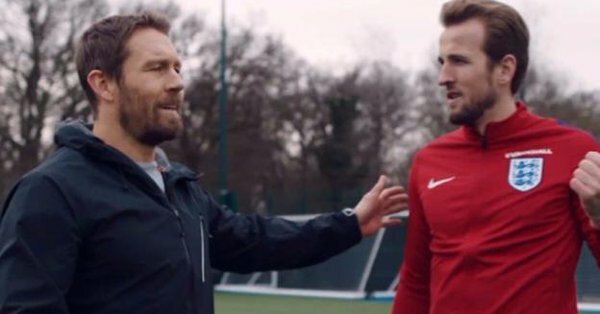 In a bid to help England win the 2018 World Cup, John Bishop and 2003 England Rugby World Cup winner Jonny Wilkinson guide Harry Kane through the steps of how to take a ‘proper’ penalty. Wilkinson’s boot famously kicked Sir Clive Woodward’s England to glory in 2003 against Australia. “No, no…you’ve got it all wrong,” says Wilkinson during the BBC sketch, putting an arm around Kane’s shoulder. “But it went in though,” the England striker hits back before Wilkinson offers to show him how it’s done – by using a kicking tee. The legendary fly-off steps up in trademark fashion around the ball before leathering it over the crossbar. “That’s how you do it,” Wilkinson smiles. “You just put it over by a mile,” says Kane. “Yes, but that’s how I won a World Cup with England,” Wilkinson retorts. “OK,” responds Kane and then smashes an effort over himself to the delight of an applauding Wilkinson. Watch below. Click through to the Mirror below to watch the sketch..
Harry Kane has received advice on how to win a World Cup with England – from Jonny Wilkinson. But Gareth Southgate may want to look away now as the Tottenham striker’s penalty practice is given a disastrous makeover by the rugby union legend.